There are eighty-eight recognized constellations in the evening sky. Depending upon one’s latitude, each will make a grand entrance or hide in the wings. For example, the Southern Cross isn’t visible north of latitude 20 degrees north. Everyone below that enjoys it at least part of the year. Orion hunts nearly all latitudes every winter, but he’ll never catch the little bear in New Zealand. That one never strays that far south, and anyone south of latitude 10 degrees south never will. Casual stargazers, no matter where on earth they live, will never experience the joys of standing in a dark field to pick out the stars of Felis. And try as one might, The Battery of Volta just won’t appear (although it sounds as if it’d make a great mystery). Sadly, at Christmas, there are no word to express how disappointed a child might be to learn that Tarandus gel Rangifer has better things to do than show up in her backyard. Welcome to the world of obsolete constellations. Yes, folks, if you thought the stars were permanent, well, they are, but it’s their groupings and names that pass on into the literal unknown. They fade into obscurity as we surely all will. But who gets to name them in the first place? Excellent question. I’ll address that in another blog. To answer this question on how it applies to constellations, here’s a quick answer: some astronomer made them up. In the case of Tarandus gel Rangifer, it was the creation of French astronomer Pierre Charles Le Monnier in 1736. He wished to commemorate an expedition from Maupertius to Lapland whose goal was to prove the Earth’s oblateness. Rangifer never caught the public’s imagination, or, it would seem, awareness. Argo Navis, or the ship Argo, falls into a grey area. It still sails the southern skies (albeit backwards) mainly in the first half of the year, but due to its unwieldy size, it was broken up into four constellations: Carina (keel), Puppis (stern), Vela (sails) and Pyxis (compass). 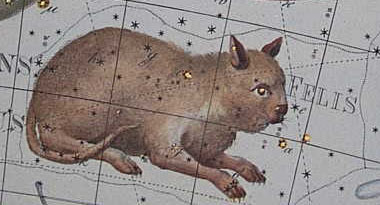 Out of the forty-eight constellations that Ptolemy recognized, it is the only one no longer recognized from that group. You can thank another French astronomer, Nicolas Louis de Lacaille for busting up the ship, as he did in 1752. One can, however, still piece Argo together, if one chooses. A star grouping shared between Vela and Puppis forms the asterism “False Cross,” which is a poor man’s version of the Southern Cross. So you know, an asterism is a grouping of stars that isn’t officially recognized as a constellation at all. They’re just part of someone else’s turf, like the Big Dipper is really part of Ursa Major. Next time you stand out on your lawn and give those nightly lanterns a good look and find yourself thinking, “Hmm, who did you used to be?” It won’t be some faded Hollywood has-been…just a few misplaced, rearranged constellations, faded from the celestial scene.